It is said that while bottoms are events, but tops are processes. Translated, markets bottom out when panic sets in, and therefore they can be more easily identifiable. By contrast, market tops form when a series of conditions come together, but not necessarily all at the same time. My experience has shown that overly bullish sentiment should be viewed as a condition indicator, and not a market timing tool. 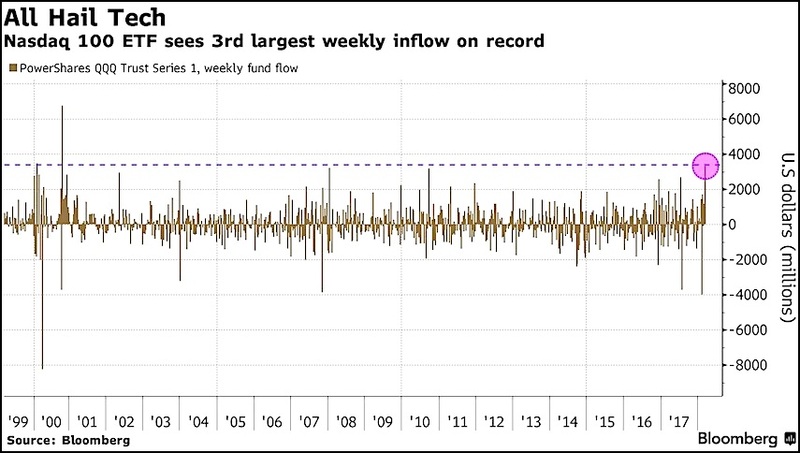 I reiterate my belief that this is not the top of the market, but investors should be aware of the risks where sentiment is getting increasingly frothy. 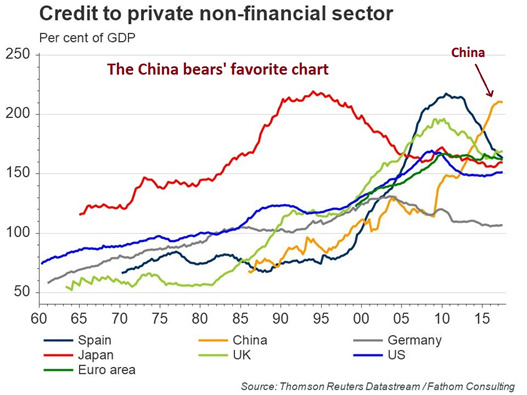 Much of the froth can be found across the Pacific in China, starting with the China bears' favorite chart. Mid-week market update: There have been a number of questions of whether the NASDAQ run is over. 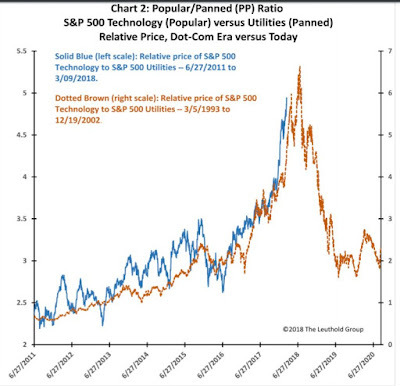 Marketwatch reported that Jim Paulsen of Leuthold Group highlighted the vulnerable nature of technology stocks. 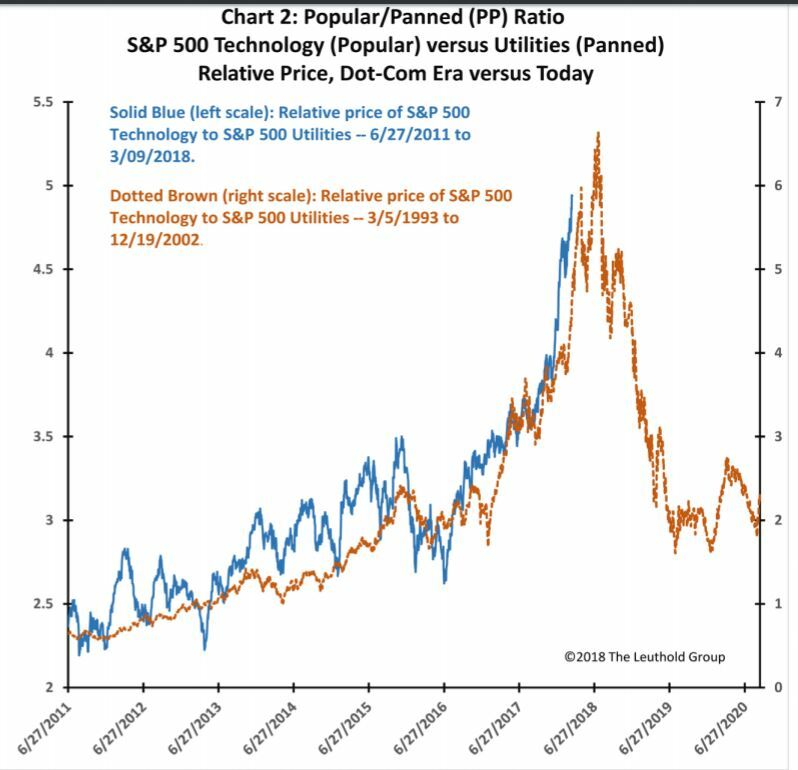 Paulsen pointed to the Tech/Utilities ratio as a way of showing that Tech is nearly as stretch as it was during the height of the NASDAQ bubble. 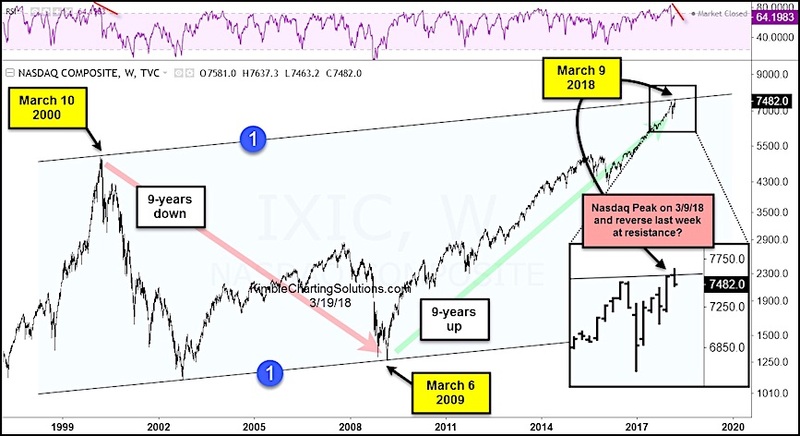 Chris Kimble also worried about the recent NASDAQ breakout, which was not followed by the major large cap averages, as well as a negative RSI divergence. In addition, Kimble highlighted the huge weekly inflow into the NASDAQ 100 ETF (NDX), which could be interpreted as contrarian bearish. If the NASDAQ falters, what would a loss of Tech leadership mean for overall stock prices? The Federal Reserve is widely expected to raise interest rates a quarter-point this week at their FOMC meeting this week. 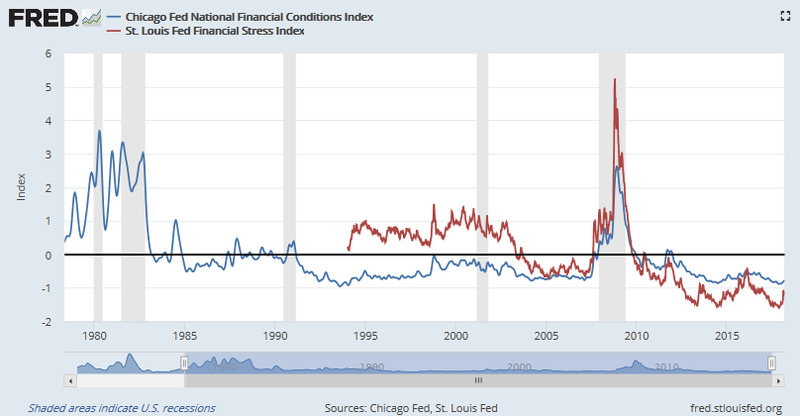 Even though financial conditions remain at benign levels, there are a number of signs that stress levels are rising during the current tightening cycle. But in 2018, the story is changing. 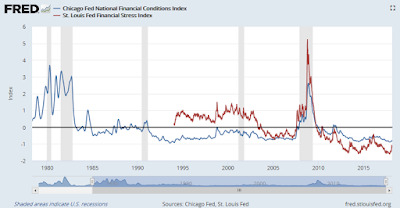 We are seeing some economic tailwinds and some headwinds. Although the tax changes are poorly conceived, and mostly benefit high income earners, there should be some short term boost to economic growth. That might lead the Federal Reserve to raise rates a little quicker than anticipated. 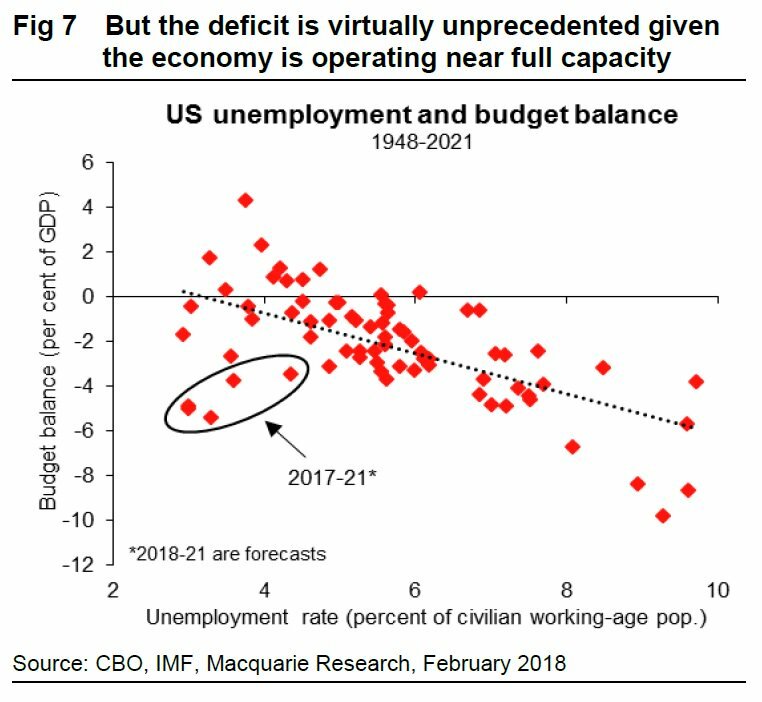 I still think the economy will be fine in 2018, but the story is changing. 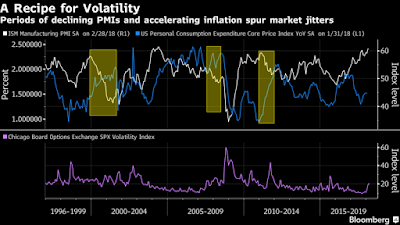 Bloomberg reported that Morgan Stanley cross-asset strategist Andrew Sheets highlighted a changing environment of weakening Purchasing Manager Indexes (PMIs) and rising inflation. Such regimes shifts have typically led to rising volatility. 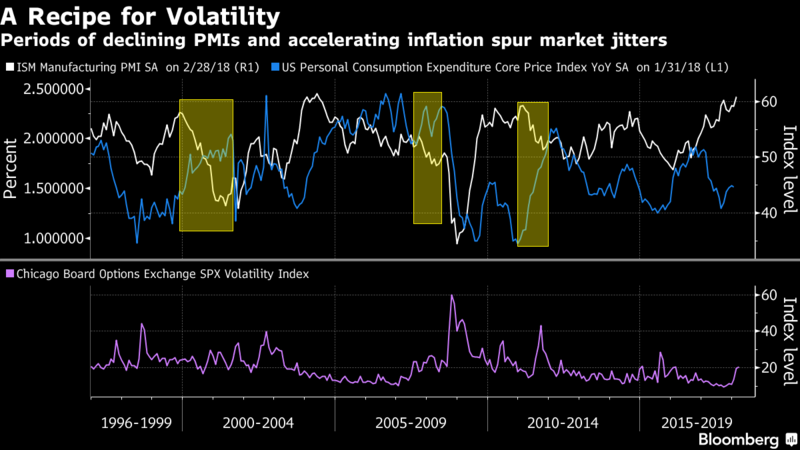 Markets have traditionally been well-equipped to handle higher inflation when it comes alongside a pickup in growth, notes Sheets. 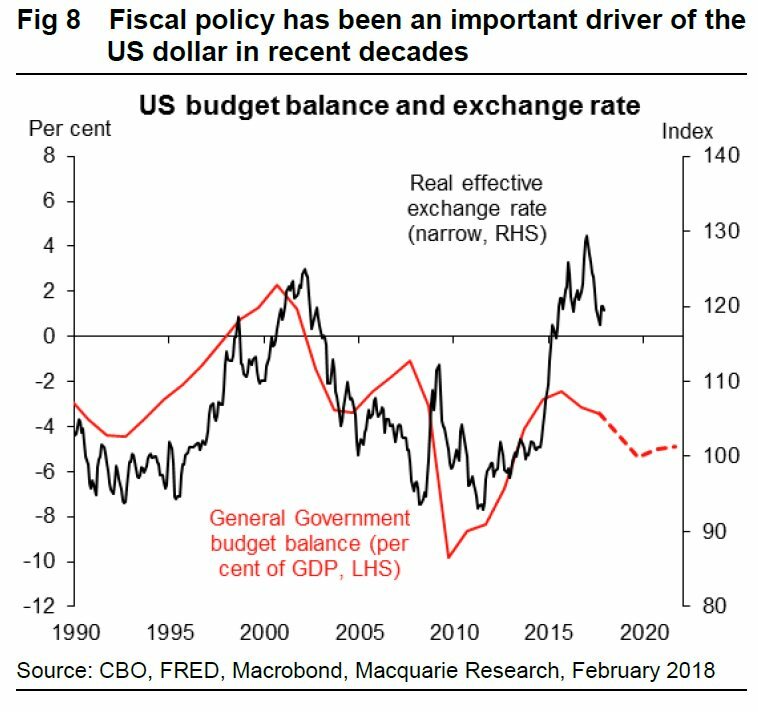 But it’s the prospect of an inflection point away from the dominant narrative of “synchronized global growth” reflected in rising PMIs, and moribund price pressures that could cause investors angst. Kevin Muir at Macro Tourist also highlighted NDR analysis that split Fed tightening cycles to fast and slow cycles. 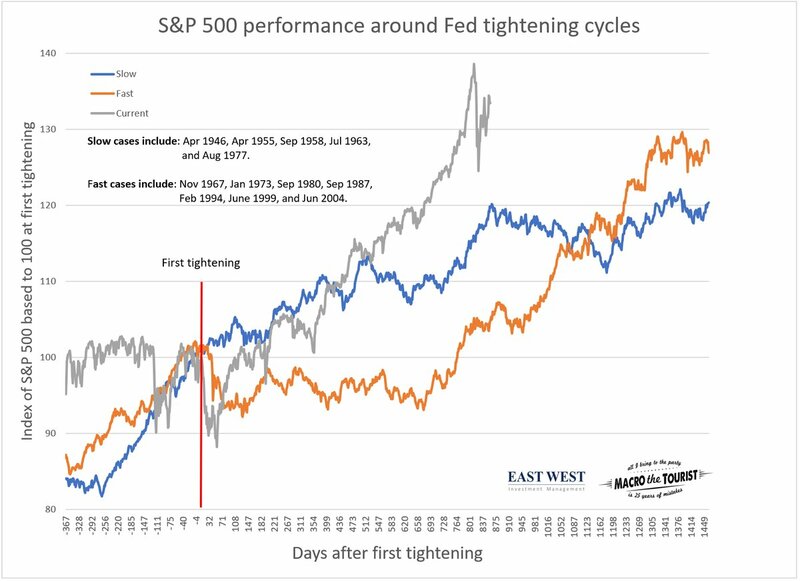 If history is any guide, this is the point where stock prices start to flatten out and weaken during a slow tightening cycle. I agree 100%. 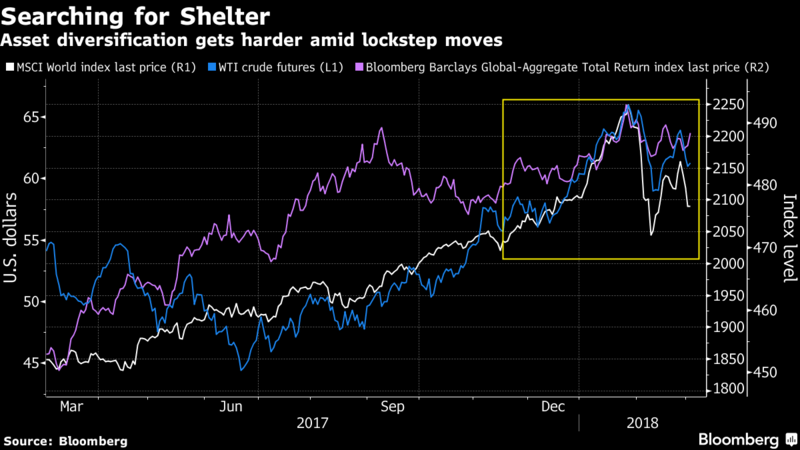 Goldilocks is dying, but the probability of a recession in 2018 remains low. 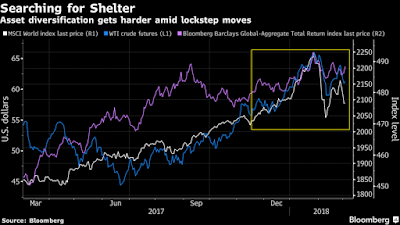 Risks and volatility are rising. It is time to review how "the story has changed". 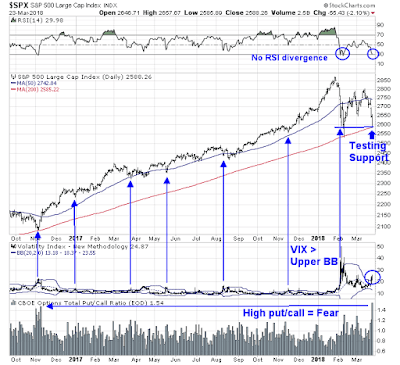 Mid-week market update: Last weekend, I wrote that while I was intermediate term bullish, I expected some equity market weakness early in the week. 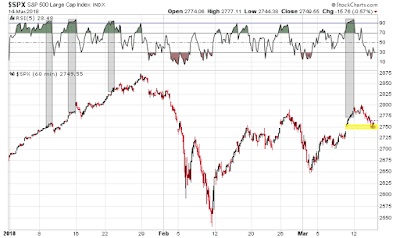 The hourly RSI-5 had exceeded 90, which is an extremely overbought reading, which was not sustainable. Even during the January melt-up, such episodes resolved themselves with either a pullback or sideways consolidation. 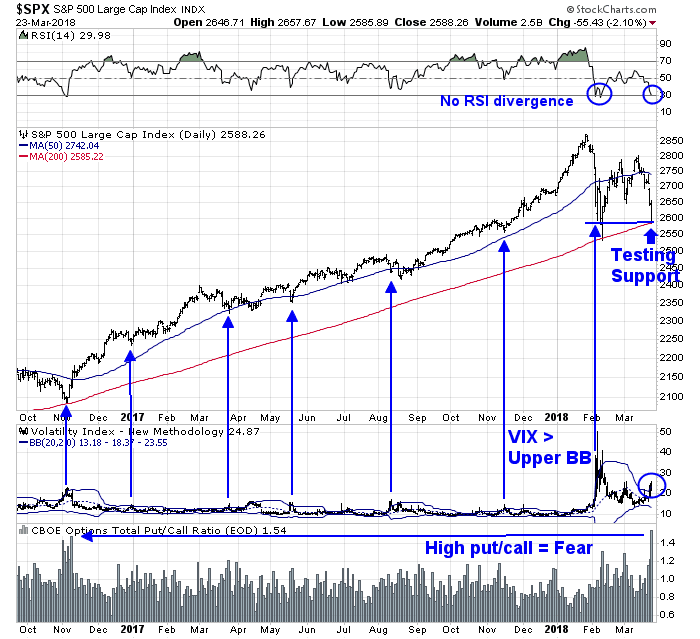 The downside risk is the 50 day moving average (dma) and the gap that was created when the market rallied on March 9, 2018. Now that the market has declined to test the 50 dma, and the gap is filled, what now? 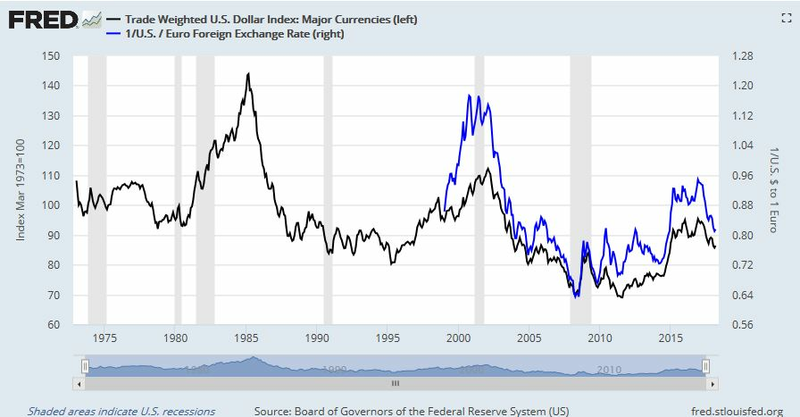 In the wake of my last post about whether USD assets and Treasury paper would remain safe haven and diversifiers in the next global downturn (see Will diversified portfolios be doomed in the next recession), I received a number of questions as to what investors should avoid. There is an obvious answer to that question. Call them the new Fragile Five. 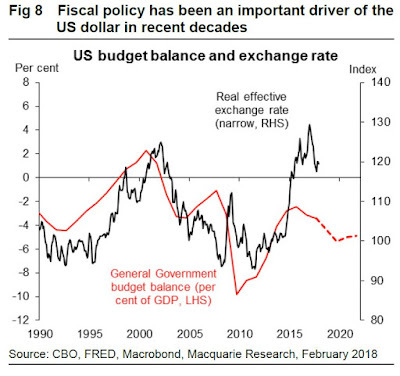 In the wake of widespread worries over the Republicans' latest fiscal experiment with tax cuts during the late phase of an expansion, a number of strategists have voiced concerns about the downward pressure that exploding fiscal deficits would put on the US Dollar. 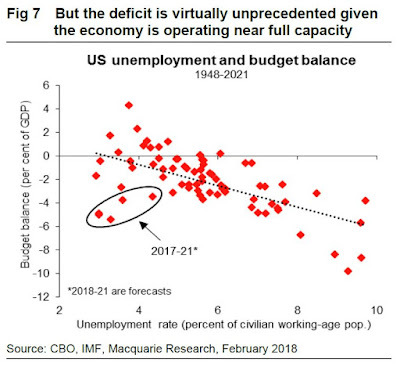 Macquarie pointed out that priming the fiscal pump during a period of low unemployment is highly unusual. This week saw the two examples of the triumph of populism. 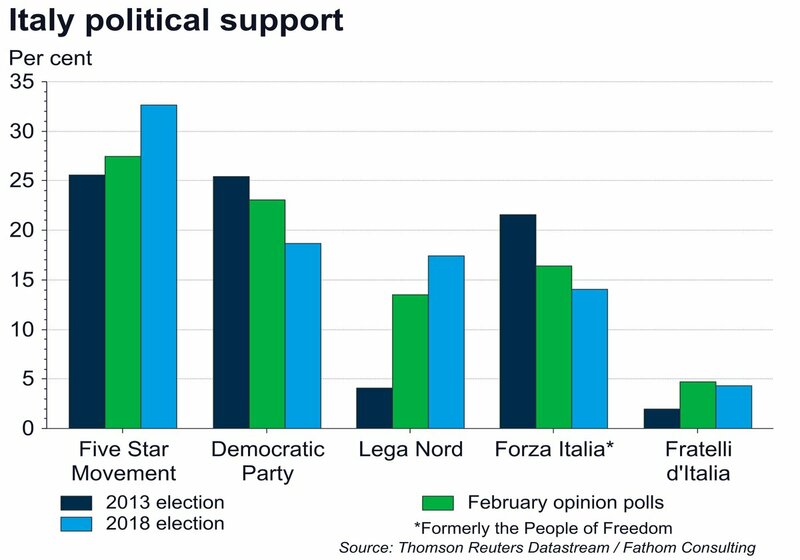 The Italian election saw the rise the Five Star Movement and Lega Nord, otherwise known as the Northern League. Both are Euroskeptic parties and Lega Nord has an anti-immigrant bias. Meanwhile in Washington, the news of the steel and aluminum tariffs put Trump's America First policies front and center. These instances of rising populism present a long-term development economic policy challenge for global elites. The long awaited W-shaped recovery? Mid-week market update: You can tell a lot about the short-term character of a market by the way it reacts to news. When the news of Gary Cohn's resignation hit the tape after the close on Thursday, ES futures cratered down over -1%. By the market closed Wednesday, SPX had traced out a bullish reversal after an early morning selloff and closed flat on the day. Is that all the bears can do? This Friday, the Bureau of Labor Statistics will release the February Employment Report. The consensus headline Non-Farm Payroll (NFP) figure is 200K, and consensus monthly change in Average Hourly Earnings (AHE) is 0.2%. Johnny Bo Jakobsen observed that forecasts based on ISM employment points to a strengthening job market. 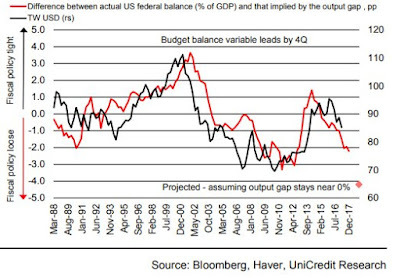 Based on this analysis, I am tempted to take the the over on NFP and AHE. Even as the market focuses intensely on NFP and AHE, there are far more important internals to watch beyond the headlines. 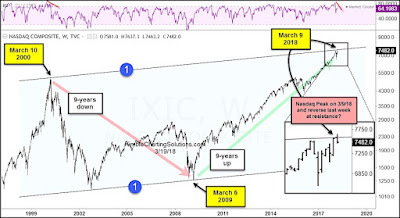 Trade chaos, or buying opportunity? Trump went on to double down on his steel and aluminum tariff announcements with a "trade wars are good, and easy to win" tweet. 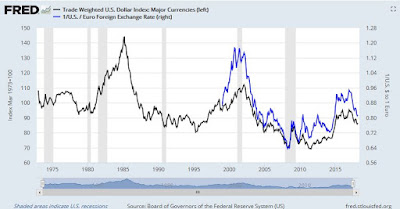 In the wake of the announcements, the charts of the market reactions to past major trade actions began circulating on the internet. 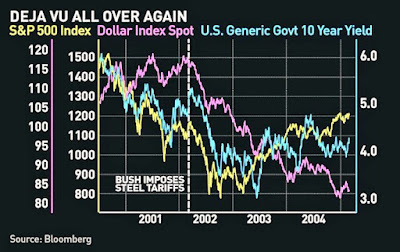 Here is what happened when George W. Bush imposed tariffs on steel in 2002. 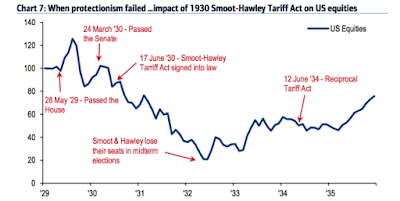 This chart shows the effects of the Smoot-Hawley tariffs during the 1930`s. Is this fear mongering? It depends on your perspective. Trade wars had a major dampening effect on global growth, but the American economy were either in recession (2002) or in a Depression (1930's) during these two episodes. 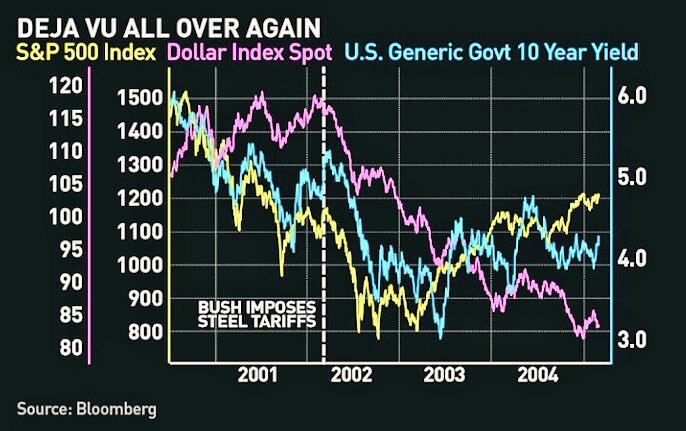 Is this a Tariff Tantrum that should be bought, or a Trade War Apocalypse that should be sold? The full post can be found at our site here.